I offer free horse racing picks in my horse racing newsletters. Remember to account for scratches and changing weather and track conditions as post time approaches. I encourage you to wager in a way you think is personally best for you. Some of you have your own strategies and ideas on how to bet the horses I recommend. For those of you with your own systems for betting, use my selections in your win bets, exactas or exotics such as triples, superfectas, and all the other wagering that is available. 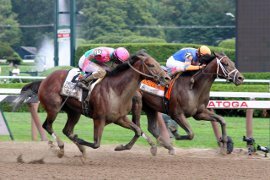 For those of you new to horse racing, see, my guide to the types of horse racing bets. Bet the top selection to win if the odds are 7-5 or higher. If a top selection goes off at 7-2 or higher, it is suggested you make a win and place bet. Most of the time I make three selections in each race given out. It is suggested that you should box the three horses. A $1.00 exacta box of the three selections costs $6.00. Of course you can wager more on the exacta box - bet your bankroll. The next move is to take the top selection and "key" this horse with the other two selections and reverse the second and third selections with the top horse for less money. An example is as follows. Say you want to bet $26.00 into the race. Let's also assume my selections are horses #1, #2, #3 and I like #1 the most, then #2 and #3. So in the end, we have ten bets equaling $26.00, the same amount as we were planning to bet on the race. Obviously you can bet less or more, but use these guidelines the best you can to wager as suggested. I give out one best bet each day. This is the horse I feel is the strongest play of the races given that day. This race should be the one on which you wager the most. The same format exists as the wagering strategies suggested above. To be a winner in this game, it is important that you learn how to bet. There is no doubt that in the short run, it may seem a bit difficult. But, it will get easier over time, especially if you follow these guidelines. Remember to wager within your comfort level. The cardinal rule to follow is to wager more when you are winning and cutting your bets down when you are losing.